Stratum, 2018 | Hand-shaped elements, black stoneware. 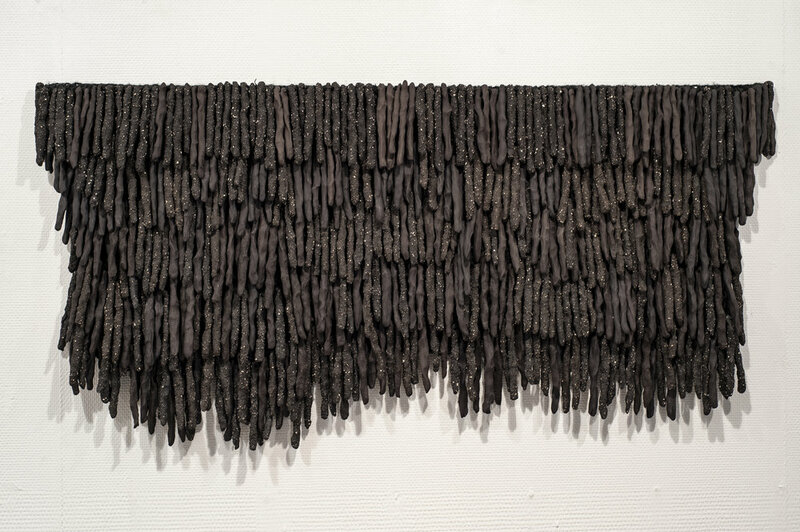 Ekre, 2018 | Ceramic tapestry, hemp, steel and unglazed stoneware. Inspired by the forces of nature, Ragnhild Wik explores the ceramics as a material. She creates unique art and use objects that bear the mark of an intuitive approach to the materials. Soil, water, fire and air are fundamental elements of nature, of which everything arises and ends. A number of unique elements shaped with the hands, transformed and mounted in an intricate interaction. Wik has developed a special technique for making "ceramic carpets" with the help of hand-knitted hemp and ceramics.